The simplified directional facility (SDF) provides a final approach course similar to the ILS localizer. The SDF course may or may not be aligned with the runway and the course may be wider than a standard ILS localizer, resulting in less precision. Usable off-course indications are limited to 35° either side of the course centerline. Instrument indications in the area between 35° and 90° from the course centerline are not controlled and should be disregarded. The SDF must provide signals sufficient to allow satisfactory operation of a typical aircraft installation within a sector which extends from the center of the SDF antenna system to distances of 18 NM covering a sector 10° either side of centerline up to an angle 7° above the horizontal. The angle of convergence of the final approach course and the extended runway centerline must not exceed 30°. Pilots should note this angle since the approach course originates at the antenna site, and an approach continued beyond the runway threshold would lead the aircraft to the SDF offset position rather than along the runway centerline. The course width of the SDF signal emitted from the transmitter is fixed at either 6° or 12°, as necessary, to provide maximum flyability and optimum approach course quality. A three-letter identifier is transmitted in code on the SDF frequency; there is no letter “I” (two dots) transmitted before the station identifier, as there is with the LOC. For example, the identifier for Lebanon, Missouri, SDF is LBO. The localizer type directional aid (LDA) is of comparable utility and accuracy to a localizer but is not part of a complete ILS. The LDA course width is between 3° and 6° and thus provides a more precise approach course than an SDF installation. Some LDAs are equipped with a GS. The LDA course is not aligned with the runway, but straight-in minimums may be published where the angle between the runway centerline and the LDA course does not exceed 30°. If this angle exceeds 30°, only circling minimums are published. The identifier is three letters preceded by “I” transmitted in code on the LDA frequency. For example, the identifier for Van Nuys, California, LDA is I-BUR. Figure 9-40. MLS coverage volumes, 3-D representation. The system may be divided into five functions, which are approach azimuth, back azimuth, approach elevation, range; and data communications. The standard configuration of MLS ground equipment includes an azimuth station to perform functions as indicated above. In addition to providing azimuth navigation guidance, the station transmits basic data, which consists of information associated directly with the operation of the landing system, as well as advisory data on the performance of the ground equipment. The azimuth station transmits MLS angle and data on one of 200 channels within the frequency range of 5031 to 5091 MHz. The equipment is normally located about 1,000 feet beyond the stop end of the runway, but there is considerable flexibility in selecting sites. For example, for heliport operations the azimuth transmitter can be collocated with the elevation transmitter. 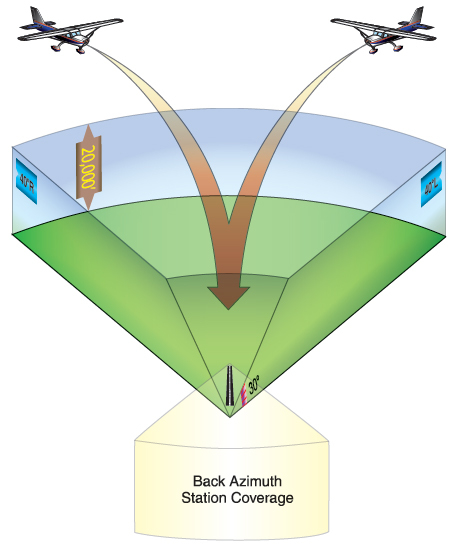 The azimuth coverage extends laterally at least 40° on either side of the runway centerline in a standard configuration, in elevation up to an angle of 15° and to at least 20,000 feet, and in range to at least 20 NM. MLS requires separate airborne equipment to receive and process the signals from what is normally installed in general aviation aircraft today. It has data communications capability, and can provide audible information about the condition of the transmitting system and other pertinent data such as weather, runway status, etc. The MLS transmits an audible identifier consisting of four letters beginning with the letter M, in Morse code at a rate of at least six per minute. The MLS system monitors itself and transmits ground-to-air data messages about the system’s operational condition. During periods of routine or emergency maintenance, the coded identification is missing from the transmissions. At this time there are only a few systems installed.